Nokia has launched its first Series 40 touch-input device in India. A pen input along with an alphanumeric keypad and handwriting recognition features. 64 MB internal user memory (13 MB free) and a 5-way navi-key. It supports optional microSD cards up to 8GB. Larger fonts for messaging and browsing as well as viewing pictures and web pages. It supports tri-band GSM (900/1800/1900MHz). Accessories : Bluetooth headset, and mini speakers. Talk time : 3.5 hours and a standby time of 300 hours. Music playback time : 11 hours. :The music player supports MP3, WMA, AAC, AAC+ and eAAC+ file formats. Amitabh Bachchan the bolly wood superstar has reacted to racial attacks on Indian students in Australia by rejecting an honorary doctorate . Family members and All Indian Human Rights Association members protest against the recent racist attacks on Indian students in Australia, in Amritsar. The Queensland University of Technology, Brisbane had offered the 66-year-old veteran a doctorate for his contribution to the world of entertainment and Bachchan had earlier accepted the title. The honour was to be conferred on the star in July as a part of celebrations to commemorate a retrospective of his films to be inaugurated in the city. his comments can be read at his blog http://bigb.bigadda.com/. Australia has recently seen a series of attacks on Indian students, the most serious being the of Shravan Kumar, a 25-year-old student from Andhra Pradesh who is battling for life in a hospital here after being stabbed by a screwdriver by a group of teens in a weekend attack that also left three of his friends injured. Internet search giant Google has won a cybersquatting case at the World Intellectual Property Organisation (WIPO) against an Indian who had tried to block the domain name 'googblog.com'. According to the information available with the WIPO, Geneva-based WIPO Arbitration and Mediation Center has ordered the transfer of domain name to the US-based search giant after Herit Shah of Gujarat offered to surrender the disputed name to Google. Google had challenged the registering of domain name 'googblog.com' by Shah at WIPO stating that it was confusingly similar to its trademark on which the company has rights. Cybersquatting is an illegal activity of buying and officially recording an address on the internet that is the name of an existing company or a well-known person, with the intention of selling it to the owner in order to make money. As per the information available with the WIPO, Google filed the complaint against Shah on March 26 this year. However, the disputed name has been registered by Shah since September 25, 2008. WIPO is a specialised agency of the United Nations for developing a balanced and accessible international system in the field of intellectual property rights. M.Phil holders will now have to clear National Eligibility Test (NET) or State Level Eligibility Test (SLET) for take up lectureship. To ensure that institutions get quality faculty, the UGC has decided to bring in stricter norms for lectureship and introduce uniform regulation for Ph.D programmes. As per the new norms on minimum qualifications for appointment of teachers, NET or SLET would be made mandatory for PG and M.Phil holders for joining lectureship. However, only Ph.D holders, who have pursued the course as per the UGC's regulation on Ph.D programmes, will get exemption from clearing NET or SLET. regulation on Ph.D programmes, states that universities will lay down criteria for the faculty to be recognised as research supervisor for M.Phil and Ph.D students. A supervisor cannot have more than eight Ph.D and five M.Phil scholars at any given point of time. The universities will decide the number of M.Phil and Ph.D seats and advertise them widely. The universities will have to admit M. Phil and Doctoral students through an entrance test. The entrance will be followed by an interview in which the doctoral students will discuss their research area. After admission to Ph.D, the students will have to do a course work for a minimum period of one semester. The professionals from outside are eyeing job in India in view of the global recession. India has also started 15 new Central Universities in February this year, creating more job opportunities. The UGC's depository will help students check duplication of work. Hyderabad based Indyarocks.com, the leader in Indian Entertainment based social networking today announced the launch of 16 free premium video Channels in partnership with nautanki.tv an Online Video distribution platform. The premium video channels can be accessed at http://videos.indyarocks.com. This enable over 3 million users of www.indyarocks.com, free online access to premium video content from Youth Channels (MTV, Channel [V], FTV), News Channels (TimesNow, Zee News), General Entertainment channels (Colors, Star), Movie Based channels (Zoom, Eros, Bollywood Hungama, Lehren) and Bhangra channel. Hyundai Motor India ltd said its premium hatchback, the i20, has been awarded the five-star NCAP rating for safety by the European New Car Assessment Programme (NCAP). The i20's five-star rating is recognition for class leading safety and performance.The i20 five-door model scored exceptionally well on all four parameters of the NCAP safety test which assess newly launched cars on four main criteria of safety -- adult occupancy, child protection, pedestrian protection and safety assist. The i20 received an average score of 80.25 per cent, the highest among the six models assessed under the new NCAP rating scheme.The car is manufactured at the company's manufacturing facility in Sreeperumbedur and is exported to the European Union and other countries and also sold in the domestic market. Stuart Broad has become England's highest-ranked bowler in the Reliance Mobile ICC Player Rankings for ODI bowlers after a successful series against the West Indies which ended at Edgbaston on Tuesday. Broad finished as the leading wicket-taker in the series with six wickets, including 4-46 in the second ODI at Bristol, and has been rewarded with a jump of four places. The 22-year-old fast bowler now sits alongside Pakistan's Shahid Afridi in a career-best ninth position.Broad has replaced Andrew Flintoff in the top 10 after the Lancastrian dropped out after missing the series due to knee injury. A player loses one per cent of his ratings for every match missed and as such Flintoff has slipped two places to 11th position. He has already played the character with negative shades in superhits like ‘Baazigar’, ‘Darr’, and ‘Anjaam’. Talking about SRK, there is no denying the fact that he livens up every character he plays. Now, he is set once again to don on the cap of a baddie in Yash Raj’s ‘Dhoom3’. ‘Dhoom’ had John Abraham as the villain and ‘Dhoom 2’ had Hrithik Roshan as the ace robber. Reports have it that SRK immediately accepted when he was given the offer by the banner. The shooting of Dhoom 3 may start early next year. However, the director of the movie has not been finalized as yet. Patlolla Sabitha Indra Reddy (46) became the first woman Home Minister of Andhra Pradesh after Chief Minister Y. S. Rajasekhara Reddy allocated portfolios to all the 35 members of the Council of Ministers on Tuesday. The three-time legislator served as the Mines and Geology Minister in the earlier government. She will head the 80,000-strong police force in the State at a time when the anti-naxalite operations has reached a decisive stage. 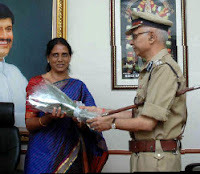 Her husband late P. Indra Reddy was also Home Minister in the N. T. Rama Rao Cabinet. Other ministers are: Rosaiah, the Finance portfolio. Dr. Reddy subject of Law & Order, apart from General Administration, Public Enterprise and all other unallocated matters. C. Shilpa Mohan Reddy (Housing) and Galla Aruna Kumari (Roads and Buildings). Small-Scale Industries to D. K. Aruna. Women & Child Welfare portfolio, Konda Surekha. Danam Nagender gets the all-important Health and Family Welfare, APVVP and Hospital Services. Pithani Satyanarayana - Arogyasri, 104, 108 and Medical Infrastructure. Users can register at store.ovi.com through their Nokia device browsers to download applications, games, videos, podcasts, productivity tools, web and location-based services. A user can get to the Ovi Store by going to store.ovi.com on either his PC or Nokia mobile phone. If a user clicks on a piece of content on his PC, the store will send his phone a text message with a link. The user clicks on the link in his phone's messaging programme, which will send him to a WAP site. Now he needs to click download and go through a log-in screen. Four more ministers from kerala will be incuded tomarrow in union ministry.they are Shashi Tharoor, a former UN diplomat who won from Thiruvananthapuram,E Ahamed (Muslim League), Mullapally Ramachandran,K.V.Thomas. Former Chief Ministers Vilasrao Deshmukh, Virbhadra Singh and Farooq Abdullah will be inducted into the Union Cabinet on Thursday when the Union Council of Ministers will be expanded to take in 59 more ministers including new entrants Mallikarjun Kharge and M.K. Alagiri. Other Cabinet ministers to be sworn in are DMK's Dayanidhi Maran and A. Raja, Congress MPs M.S. Gill, Kumari Selja, Subodh Kant Sahay, G.K. Vasan, Pawan Kumar Bansal, Kantilal Bhuria (all elevated from the level of Ministers of State) and Congress leader Mukul Wasnik. With Thursday's expansion, the total strength of the Council of Ministers will go upto 79 including Prime Minister Manmohan Singh. Mr. Virbhadra Singh, a former Chief Minister of Himachal Pradesh, has been elected from Mandi while Mr. Abdullah from Srinagar in Jammu and Kashmir. Mr. Deshmukh, a former Maharashtra Chief Minister, is not a member of either House of Parliament. Those being inducted as Ministers of State with independent charge are Praful Patel (NCP), Prithviraj Chavan, Sriprakash Jaiswal, Salman Khursheed, Dinsha Patel, Jairam Ramesh and Krishna Tirath (all Congress). Prominent among the new ministers to be sworn in tomorrow are : Sachin Pilot and Praneet Kaur, wife of former Punjab Chief Minister Amarinder Singh, and Agatha Sangma, daughter of former Lok Sabha Speaker P A Sangma. Thursday's expansion will also see induction of six Trinamool Congress MPs, four from DMK and one from Muslim League. Mr. Praful Patel retains his status while Mr. Chavan, Mr. Jaiswal, Mr. Dinsha Patel and Mr. Ramesh have been promoted to hold Independent charge. Prominent Ministers of the earlier government who have been dropped include Arjun Singh, H.R. Bhardwaj, Sis Ram Ola and Saifuddin Soz (all Congress) and T.R. Baalu (DMK). Ministers of State who did not find a place in the new government are Ashwini Kumar, Rao Inderjit Singh and Santosh Bagrodia (all Congress). The other Ministers of State who would be sworn in are V Narayanaswamy, Namo Narain Meena, Srikant Jena, , A Sai Prathap, Harish Rawat, D Purandeswari, Panabaka Lakshmi, Ajay Maken, Gurudas Kamat, K H Muniyappa, Jyotiraditya Scindia, Jitin Prasada, M M Pallam Raju, Mahadev Khandela, and K V Thomas (all Congress). Other Congress leaders to make it to the Council of Ministers are Bharatsinh Solanki, Tusharbhai Chaudhary, Arun Yadav, Prateek Prakashbapu Patil, R.P.N. Singh, Vincent Pala and Pradeep Jain. The TMC members to be sworn in are Saugata Ray, Dinesh Trivedi, Sisir Adhikari, Sultan Ahmed, Mukul Roy and Mohan Jatua. Ministers of State from DMK will be S.S. Palanimackam, who retains his place, actor D. Napolean, S. Jagathrakshakan and S. Gandhiselvan. Of the 59 to be inducted on Thursday, 42 belong to Congress, taking the total number of ministers from the party to 60, including the Prime Minister. Ministers to be sworn in on Thursday will include seven of DMK, six of TMC, two of NCP and one each of National Conference and Muslim League. Out of 42 from Congress, 10 will be Cabinet ministers, six with Independent charge and 26 Ministers of State. In all, Congress will have 28 Cabinet Ministers, including the Prime Minister. Congress saw a substantial revival in the Lok Sabha elections. Gulf Mart to open its fifth branch in Kuwait. The new branch will be located at Dana complex in Salem al Mubarak street in Salmiya. The new branch is easily accessible for the Salmiya residents and provides enough parking space for the customers. Gulf Mart offers substantial discounts throughout the year - not to just attract customers but also to help consumers shop economically in accordance to their daily budgets. Gulf Mart's expansion plans will continue right through 2009 .Gulf Mart is having their other stores located in Shuwaikh , Fahaheel, Jleeb Al-Shuyoukh and Hawally. Collection and submission of Indian passport and visa applications and their delivery to applicants in Kuwait will take place only via two Indian Passport and Visa Service Centres located at the following addresses Effective from Wednesday, 27 May 2009. 1. Emad Commercial Centre, Basement Floor, Ahmed Al Jaber Street, Sharq, Kuwait City. Telephone: 22470005. Telefax: 22470006. 2. Mujamma Unood, 4th floor, Office No. 25-26 Makka Street, Fahaheel, Kuwait. Both Service Centres will function from 0800 hrs. to 1200 hrs. and 1600 hrs to 2000 hrs. from Sunday to Thursday, and from 1600 hrs. to 2000 hrs. on Saturdays. They will be closed on Fridays and major public holidays. Both Centres are located at venues that are regularly served by public transport and have free parking space available nearby. An Indian Company, M/S BLS International Visa Services, will operate both Service Centres, which will also offer the following facilities: [a] Information desk; [b] Free distribution of passport and visa application forms; [c] Filling of passport and visa application forms [at nominal charge]; and [d] Photocopy facility [at nominal charge]. A service fee of KD 1.500 for Passport Services and KD 5.000 for Visa Services per application will be charged by M/S BLS International Visa Services, in addition to the Passport and Visa fees of the Government of India. The website http://www.bls-international.com/, which will be functional from Sunday, 24 May 2009, will provide details of all passport and visa services available at both Service Centres. A Consular representative of the Embassy of India, Kuwait, will initially be available at both locations in case of need for any clarification. Applications for visas on Diplomatic/Official/Special passports as well as for issue of PIO/OCI cards and Emergency Certificates will continue to be accepted directly at the Embassy of India, Kuwait. Affidavit/Attestation services will also continue to be provided at Embassy of India, Kuwait. A new casual online game on Swine Flu – a pandemic that wrecked havoc across the globe killing hundreds of people in Mexico – Swine Flue Killer.The game is available in its online gaming portal www.onlinerealgames.com . To play this game, all a gamer needs to do is vaccinate as many patients as possible in time, kill the virus, save patients and become a Swine Flu Killer. To vaccinate a patient, simply click on the patient with the mouse. The more quicker a gamer's movements are while clicking on the patients, the more points he gains. 7Seas Technologies Limited is an independent IP-based game development company based out of Hyderabad. The company’s online gaming portal www.onlinerealgames.com has about 300 casual games. www.neodelight.com has over 400 another game portlal has casual games. 7Seas' online game ‘Mouse Maze’ has bagged the prestigious FICCI-BAF (Best of Animation Frances) award in the 'Best Online Game' category for 2008. 7Seas has also bagged the ‘2008 International Stevie Business Award’ in the ‘Best Website’ category for its online gaming portal www.onlinerealgames.com. On 22nd may 2009 the Music launch of Siddhardh’s latest film Oy! was held at Rama Naidu studios. K Raghavendra Rao launched the audio CD and gave it to Rajamouli. Prabhas launched the audiocassette and gave the first unit to D Suresh Babu. Prabhas, Siddhardh, K Raghavendra Rao, KS Rama Rao, SSRajamouli, Bommarillu Bhaskar, Seenu Vytla, D Suresh Babu, Yuan Shankar Raja, Anand Ranga etc attended the function . Telugu handsome hero who became famous with his movie Devadas after celebrating his birthday recently taken a step further in getting closer to his fans. On his special day, he launched his personal website www.heroram.com and said that this would enable to keep him in closer contact with his fans and they can also get updated about his movies and latest happenings. Currently, Ram is busy with the shooting of his new venture . 1.Degree/diploma in Chemical/Mech.Engg or B.Sc/M.Sc with 15 years exp. Narmmadaa Ahuja, daughter of actor-politician Govinda, is about to make her film debut. and she could well become No.1 in bollywood. for this, daddy has reportedly got the director and producer who gave him hits like Coolie No. 1 and Hero No. 1 — David Dhawan and Vashu Bhagnani, though Sanjay Leela Bhansali had been his first choice. The male lead in this film is expected to be Shahid Kapur.Ever since, there has been speculation that Govinda’s beautiful daughter Narmmadaa Ahuja would enter Bollywood. Putting rumours to rest, it’s now clear that the girl will soon follow her dad’s footsteps into the world of cinema. Though she carries off Indian as well as western looks and styles almost effortlessly, she might best fit in a glamour girl image. What’s more! The girl has already been signed by a famous producer, whose name will be revealed only next week. Meanwhile, numerologist Niraj Mancchanda (who has added the extra ‘m’ and ‘a’ in Narmmadaa’s name) says, “Watch out for her. She will get a lot of offers after August.” Let’s see if his crystal ball of numbers creates more magic. Narmmadaa shares her birthday with Katrina Kaif on July 16. She is 1988 born. “Her 22nd year would be an average phase for her. She will be getting offers but she won’t be in the right frame of mind to decide anything. She should immediately wear a yellow sapphire for better focus and finding the right direction,” suggest Sangghvi. Kathmandu Veteran Communist leader Madhav Kumar Nepal will be sworn-in as the Prime Minister of Nepal today, even as his CPN-UML constituted a committee to hold dialogue with allied parties on government formation and reach an understanding regarding a Common Minimum Programme. Mr. Nepal, who was elected as the Prime Minister on Saturday in the Constituent Assembly, will be sworn-in by President Ram Baran Yadav at 11 am on Monday, adding he will assume office the same day. The party has appealed to all political outfits to extend cooperation to the new government to complete the peace process and to draft a new constitution. Sources close to the Prime Minister said that the PM will meet Nepali Congress president Girija Prasa Koirala, Madhesi People's Rights Forum chief Upendra Yadav and other leaders of various parties to seek their views regarding the shape and size of the cabinet to be formed shortly. offer valid until may 27th. Within the range of its unique and exclusive client services, Viva today launches a new service - Viva Land, which is one in a long series of innovative, communicative and entertainment services that are the gateway to a more comprehensive range of content services which comprises a variety group of educational, interactive and recreational services via SMS and MMS. Viva's VAS new content launch would enable clients to choose their best service categories, which includes news casts from CNN and BBC and also from Arabic channels such as Al-Jazeera both in Arabic and English, in addition to local and international news bulletins. It also offered weather, sports, business, entertainment and other reports. Quranic interpretations in addition to a wide range of religious additions comprising religion-inspired background displays, mosques, recitations of hymns and verses of the Holy Quran. It also offeres artistic services for ladies through which women would be able to receive daily tips on the mobile in various spheres of interest. 'Moreover, the launch also included entertainment and amusement services, which comprised movie videos, comic strips, sports footages, documentaries and other many other services, and clients would be able to forward any of these items to family members and friends, which made the launch yet more exclusive and unique. Manmohan Singh was today sworn-in as Prime Minister for a second term along with 19 other Cabinet ministers .Putting together his government literally brick by brick, Prime Minister Manmohan Singh apportioned work to six of his Cabinet colleagues on Saturday. Finance has been assigned to Pranab Mukherjee; Agriculture, Food & Civil Supplies, Consumer Affairs and Public Distribution to Sharad Pawar; Defence to A.K. Antony; Home to P. Chidambaram, Railways to Mamata Banerjee and External Affairs to S.M. Krishna. Arjun Singh, H R Bhardwaj and two other senior ministers of the previous Cabinet have been excluded. The 19 ministers, all of Cabinet rank, include Ghulam Nabi Azad, Veerappa Moily, new entrant Rajasthan PCC chief C P Joshi and Anand Sharma and B K Handique, who were promoted from the previous ministry.Others inducted were S Jaipal Reddy, Kamal Nath, Vayalar Ravi, Meira Kumar, Murli Deora, Kapil Sibal, Ambika Soni and Sushil Kumar Shinde. Another group of ministers, probably a larger one, is expected to be sworn-in on Tuesday next. The Congress is apparently willing to return Communications and Information Technology to Dayanidhi Maran, while Mr. Baalu will have to settle for Chemicals & Fertilizers and Mr. Raja, Labour. Besides, the DMK will be allowed three Ministers of State but none with independent charge. Mr. Karunanidhi’s two children — newly elected M. Azhagiri and Rajya Sabha member M. Kanimozhi — will at best become Ministers of State under this formula. Parliament be convened from June 1 to 9 to swear in the newly elected members of the 15th Lok Sabha. The session will have seven sittings. The Speaker’s election will take place on the third day of the session and the President will address a joint session of Parliament on the fourth day. The remaining three days have been set aside for taking up the discussion on the Motion of Thanks on the President’s address. The process of passing the budget had to be completed by July 31. CDS invites applications for admission to its full-time residential programme leading to MPhil in Applied Economics of the Jawaharlal Nehru University, commencing on August 03, 2009. Candidates can choose to be considered for provisional enrolment for PhD in Economics, either after the MPhil coursework or the full programme, if meeting the requirements.The Programme has two-semester course-work and a dissertation. We pride ourselves at being a Parliamentary democracy, but now more than ever before there are so many hinges on the role of the President. With results likely to be down to the wire, who will the President call to form a government? President Pratibha Patil has been in touch with legal experts but individual parties are also consulting legal and constitutional experts. She has been studying what her predecessors did in similar situations. In 1989, president Venkatraman invited the single largest party, the Congress, which declined. VP Singh then formed the National Front government with support from the Left and the BJP. Again in 1996, when Shankar Dayal Sharma invited the single largest party, the BJP, the government lasted a mere 13 days. However, the most pertinent precedent was in 1998. President K R Narayanan insisted Vajpayee produce letters of support before appointing him Prime minister. Which is why the BJP's stand this week is so important. They want President Patil to invite the single largest pre-poll formation first. "The president must call the single largest poll formation and the single largest party," said BJP leader Ravi Shankar Prasad in a press conference. Not wanting to be out maneouvered by the BJP's stand, the Congress is focusing on getting letters of support, rather than wait and see who the President invites first. "We leave it to the President," said Congress leader Kapil Sibal. Who President Patil invites first to form the government is critical. Will it be the single largest party? In which case smaller parties could gravitate towards it. Or will she invite the largest alliance? Constitutional experts like Rajeev Dhawan say it will be President Patil's discretion, but the prime minister must convince her that he will be able to win a vote of confidence. So if India does elect a hung Parliament, President Pratibha will play a critical role and every move she makes will be followed closely. With indications of none of the Alliance getting majority to form the next government, both Congress led UPA and BJP led NDA have began hunting for new allies to cobble up the majority mark of 272. With Congress looking for support from estranged ally Samajwadi Party, BJP is wooing AIADMK chief J Jayalalithaa, who could emerge as a likely kingmaker in the entire exercise. Congress too is trying to bring Jayalalithaa into the UPA fold. Jayalalithaa is still to make clear with which alliance she will be going. The Left Parties who want to keep BJP led NDA out of power, have already said they will not create hurdles in government formation by Congress. However, according to Left leaders, the Third Front will make all possible attempt to form a non Congress and non BJP government at Centre. Though a final picture will be out only tomorrow, the day Lok Sabha election results are out, the exit poll predicts a hung House with a slight edge to the Congress led UPA alliance. The signs of GM going bankrupt was clearly evident yesterday after shareholders sent the company crashing on the New York Stock Exchange. The company’s shares stood at $1.14 at the end of day’s trading, lowest since 1933, just as America was starting to recover from the depth of the Great Depression. This was clearly a sign shareholders were resigning themselves to making the little they can from the shares before they become almost completely worthless, but of course, some will still hold out in the hope they avoid bankruptcy somehow which could of course revitalise the shares to some extent and could double or triple if GM was to confirm it would avoid bankruptcy (this is not a tip in any way whatsoever), like it did to an extent for Ford in the last couple of months when the air of gloom over them lifted after confirming they would not need bancruptcy protection (but their shares did get hit yesterday after raising more cash by issuing new shares thus obviously diluting the existing shareholders’ capital). What made it even worse for GM was that some key figures in the company sold their lot. There is nothing worse for confidence when your own directors have no confidence in the company, is there? The so called big 3 of Detroit have endured great mismanagement over the last few years, long before the current financial crisis just made things a lot worse, and in fact, for companies like Chrysler and possibly GM now, the proverbial final nail in the coffin. Tamil dubbed Ananthapuram-1980 is getting released this Saturday(May 16th). It's dubbed version of Tamil movie Subramaniapuram, this movie catapulted Swathi (colors swati starrer) in to big league. The movie is packaged neatly with a succinct narration, it doesn't boast big starcast. The makers are hopeful of having the same success it had in Tamil. Namitha has finally agreed to do a Malayalam film for director duo Pramod Pappan. The film titled Black Stallion will have Kalabhavan Mani as the hero, while Bala, who has acted in a few Tamil films, has also been roped in for an important role. Namitha, who has a huge following in Kerala, will be doing a full-fledged heroine’s role in Malayalam for the first time. Leading writer Rajesh Jayaram is doing the script and Ouseappachan the music for this suspense thriller, in which Namitha is going to sport a very glamorous look. Remember, directors Pramod and Pappan were the first to spot the hidden glamour and sensuous side to Nayanthara in her early days when she did their Taskaraveeran? project funding and financial control, contract Mgmt. Remarks:Candidates ready to join immediately preferred. Rahman releases 'Eesa' Audio .Music directorHaran makes his debut with the film. Nameetha starrer 'Jaganmohini' unit is said to be working overtime with a view that the film should do better than Anoushka's 'Arundhathi'. Producer Murali has apparently instructed his crew to leave no stone unturned to ensure that the film should have graphic sequences equal to, if not better than 'Arunthadhi' which has been doing brisk business in Tamil, Telugu and Sinhalese languages. Telugu hit "Arundhati" is all set to be remade into Hindi and the makers wanted to cast Anushka Sharma in the title role. heroine couldn't be finalised for it because of some misconceptions. Now they might settle for the actress who played the lead in the Telugu 'Arundhati' in Hindi. Coincidentally, her name too is Anushka (Shetty) . Many producers, including Madhu Mantena, who produced "Ghajini", were vying for the Hindi remake rights. But Telugu producer M. Shyam Prasad Reddy is finally making it it in Hindi.Sonu Sood, who played the main antagonist in the Telugu version and is set to encore the same part in Hindi, confirms these developments.Priyadarshan was approached to direct "Arundhati" in Hindi but apparently he wasn't ready to accept the offer at such short notice. Despite an advisory issued by the Union Health Ministry that says chemists in India are not authorised to sell Oseltamivir Phosphate (Tamiflu) in retail outlets, several medical stores in Bangalore are selling this medicine to people across the counters. places up the Indian Premier League log to fourth. Brendon McCullum as Bangalore defeated Kolkata by six wickets in a thriller. who made 176-4 in 19.2 overs with unbeaten 81-run Taylor the hero. -run stand with the West Indian for the third wicket. a plan that worked out perfectly. Punjab 119-9 in 20 overs (S Sohal 43, K Goel 20 not out; J P Duminy 2-15). Mumbai 122-2 in 16.2 overs (D Bravo 70 not out, S Tendulkar 41 not out) Mumbai win by eight wickets. Kolkata 173-4 in 20 overs (B McCullum 84 not out, D Hussey 43; V Kumar 2-33). Bangalore 176-4 in 19.2 overs (R Taylor 81 not out, J Kallis 32, J Ryder 22; M Kartik 2-28) Bangalore win by six wickets. in reputed schools, with excellent communication and leadership skills. Must have good analytical skills and knowledge in Tally. send sms:52244, 53344 to these numbers in format HSE register number . SSLC RESULTS 2009 will be declared by the Hon. Minister for Education at 10.30am on 08/05/2009. The results can be had through phone and SMS. Those who need results over phone should dial 1255678 from BSNL and 56006780 from Idea, Vodafone, Reliance and Airtel.To obtain results via SMS send message in the following format to 5600678.SSLC <> register number. Kerala SSLC Results will be available on these sites once the Results are published on the Web.
" God could not be everywhere and therefore he created Mothers "
The modern Mother's Day holiday was created by Anna Jarvis as a day for each family to honor its mother, and it's now celebrated on various days in many places around the world. In the UK, Mother's day is celebrated on the 4th Sunday in Lent (this year on 22 March) but in other countries around the world, it is celebrated at different times. In Europe most countries honor their mothers on the second Sunday in May as do the Americans. May 10th is the day dedicated to mothers in many Asian and Middle Eastern countries. Many of these countries also use flowers to celebrate. Its time to Greet her in best possible way with Flowers and Gifts. Requirements:Strong HR Generalist with 5+ years experience as a Manager. Existing experience with labour unions, excellent knowledge of Indian labour law and other relevant regulations. Recent experience of SAP is essential. Experience of Industrial HR, although not essential, would be highly desirable. Work experience in a company with well respected, leading edge HR practice. Good understanding of business dynamics. Requirements: professionals as well as fresher in all functions. email your resume by writing interested function name on subject. The stage is set for the commencement of the annual ‘kalyanotsavam’ of Sri Veera Venkata Satyanarayana Swamy on May 4 for which the hill shrine is wearing a resplendent look with beautiful decorations. Nearly 1,00,000 devotees are expected to witness the celestial wedding of the Lord and goddess Mahalakshmi. Special rituals will be performed by 150 to 200 Vedic pundits on all days of the festival that concludes on May 10 . This year’s highlight is telecast of the ‘kalyanotsavam.’ in 24 countries by private television channels. Dramas by famous Surabhi troupe are lined up among the cultural events to be presented by artistes. A 90-feet ‘Satya Prabha’ will be a major attraction for devotees. Besides, there will be floral depictions of ‘Dasavatarams’ with a wide variety of flowers brought from Kadiam and other places. The special rituals include ‘Edurkolu Utsavam’ (‘Suprabhata seva’, ‘Chaturveda parayanam’ and ‘Ghanaswasti’) on May 4, ‘Divya Kalyana Mahotsavam’ (‘Dhwajarohanam’, ‘Gowri puja’, ‘Kankana dharana’ and ‘Kalyanam’) on May 5, ‘Ravana Vahana seva’ on May 6, ‘Veda Pandita Sadasyam’ and ‘Ponna Vahana seva’ on May 7, ‘Vanaviharotsavam’ and ‘Vendiradhotsavam’ on May 8, ‘Sri Chakrasnanam’ on May 9 and ‘Sri Pushpa Yoga Mahotsavam’ on May 10. A well known south indian film actress Meena is getting married on july 12 th at Tirpuathi temple.she has acted in telugu,tamil , malayalm movies .she got engaged last day at saidapet chenni.Her Fiancee is a software engineer at Banglore. Fly is operated by the Meridian Telecoms Group. Fly phones are currently available in 25 countries of the world and is one of the fastest growing mobile phone brands in the markets it competes in. We hold a 5% global market share. Our range comprises of Mid & High-end phones. Fly, with its highly differentiated range has been received with great enthusiasm in India by the trade as well as the users.Meridian Mobile Private Limited is part of the Meridian Group, headquartered in Europe. The company is now expanding rapidly in India by developing a large offering under the Fly brand. The products include: Feature Phones, Smart-phones and Mobile Phone Accessories. Meridian came to India on October 2004 and the Fly brand was launched in India in June 2005. With 10 Regional Offices and a Head Office based in New Delhi, the company has a head count of over 4000 employees and is entrenched in over 7000 top mobile shops in 145 cities. The unveiling of the brand was kick started by the announcement of Malaika Arora Khan as the brand ambassador. The company has a pan India presence and within a short span of time it has become the fastest growing mobile phone company in the country with a significant market share within its range. Product development is a key strength of Meridian. Fly is available with a variety of exclusive and differentiated mobile phones. Manama: The car explosion that killed a Bahraini passenger and critically injured the driver, also a Bahraini, was caused by a home-made bomb, Brigadier Isa Al Musallam, the head of the Criminal Investigation Directorate (CID), said. "The bomb was placed next to the dead man before it exploded, resulting in one death and serious burns to the face of the second person," he said. The statement comes amid the wild speculations that engulfed the country following the announcement of the Thursday night explosion in Daih, a small village in the outskirts of Manama, the capital. Abu Dhabi: Owners of properties and residential units will be able to enter the UAE on a multi- trip entry visa that allows them to stay up to six months. The move is line with a ministerial resolution issued by Lieutenant General Shaikh Saif Bin Zayed Al Nahyan, Interior Minister, with the aim of enhancing the local economic environment and providing all fundamentals that help ensure economic growth and prosperity in the country. Under the resolution, the multi-entry permit can be renewed under certain conditions. The resolutions is part of the UAE government efforts to introduce adequate legislations that stimulate and boost the domestic economic environment and provide all factors that will ensure highest rates of growth and prosperity as per the vision of the prudent leadership and its continuous directives to improve and upgrade procedural formalities and frameworks to satisfy demands of local markets and serve public interest. The move also underlines the government commitment to serve interests of all persons who view the country as an oasis of stability and peace, therefore possessing properties in it. By allowing those persons to bring in their wives and children, the government shows its keenness to ensure family stability to them. The new resolution adds a new paragraph to Article 33 of the executive regulations of the entry and residency law for entry and residency of foreigners. It reads: ''Owners of built-in properties can stay for six months from the date of entry into the country. On the expiry of this period, the owner pledges to depart for his home country or any of the GCC countries. He will only be allowed to enter the country again after meeting the required conditions''. Another new article, number 34, will be incorporated into the by-law stipulating that the owner should submit a multi-trip entry visa in regards to the property as per the following conditions. The property should be built-in and this case doesn't include owners of vacant lands. The owner should obtain a title of the property from the property registration authority in the emirate. The unit, be a house or an apartment, should be wholly owned by the concerned person. The same article stipulates that the value of the unit should not be less than Dh 1 million. The unit should be fit for accommodation and for members of the family. The departments of naturalisation and residency will scrutinise this point. The article allows the owner to include in the visa application his spouse and children and attaches an insurance cover (for him, his wife and children) valid for the limit of the stay in the country. Article 34 stipulates that owner should have a fixed income of not less than Dh 10,000 or its equivalent in foreign currencies whether inside or outside the country though the visa doesn't give the owner of the property the right to work inside the country. In case these terms are not met, the permit shall be null and void. The resolution will take effect from the date of its issuance, and is to be published in the official gazette.